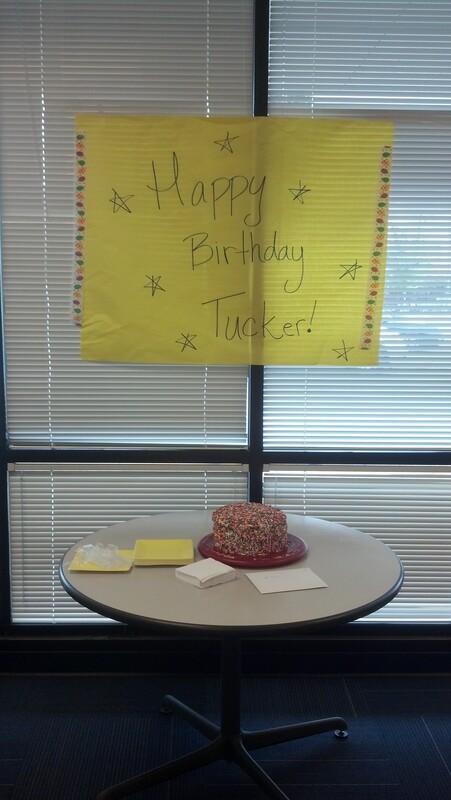 Yesterday was one of my co-worker’s birthday. She is much more to me than just a co-worker. She is a friend and a mentor to me. She is giving and caring and I thought that it wouldn’t be a good birthday if she didn’t get a fabulous surprise cake! Another co-worker and I gathered up some people and surprised her with a special home made cake at work. This is my “pinspiration” (inspiration from pinterest). It is from Style Me Pretty. (Click the link to see the original post) I went to Walmart and picked up the $1 Pillsbury vanilla and chocolate cake mixes. I also picked up 2 of the Pillsbury classic white frosting and the biggest tub of sprinkles I could find. Now I’m going to go ahead and put out there that I am not the best baker in the world at all, so don’t laugh at me. (you can laugh with me though) So this is reality, unabridged unedited. 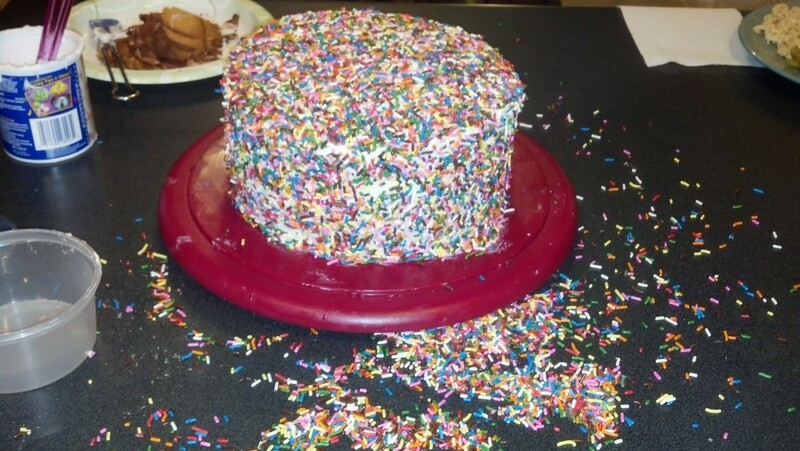 I made a huge mess with sprinkles all over my kitchen. The inside of the cake is marble, oh and uneven. This is the great thing about making homemade treats, they can see the work that you put into it. Take for example the middle layer that is split into thirds and glued back together with frosting, it is being held together by love and hard work (and a prayer). 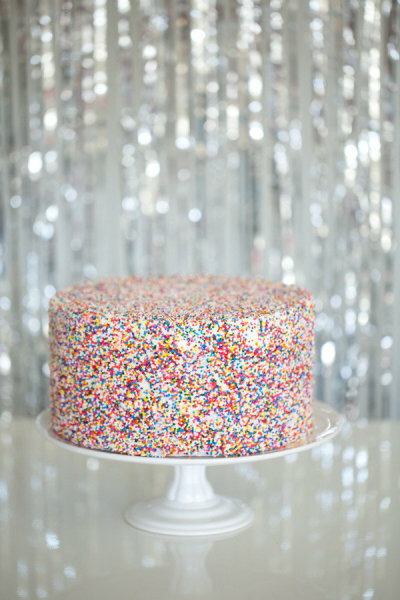 If someone cuts into it and half the cake falls to its death, it only makes the memory that much greater. Spending love and saving money at the same time. I went to Dollar Tree and got streamers as well as plates, napkins, and forks for our little cake extravaganza. The Dollar Store has a nice little selection of colors for paper supplies. I much prefer going to the Dollar Tree rather than Walmart or Party City for paper party supplies. Overall the “party” was successful. She was fully surprised and everyone seemed to enjoy themselves and the cake. My marble effect was below par. I basically ended up mixing them together with a few light and dark spots. My mission was completed when she walked in and felt all the love from everyone waiting to yell, “Happy Birthday!” As long as she felt how special she is to me, and many others, everything went as planned!